Social scientists often promote the value of public provision of infrastructure as a sound, long-term investment in development and prosperity, pushing back against the neoliberal tendency to abandon public goods in favor of private development. 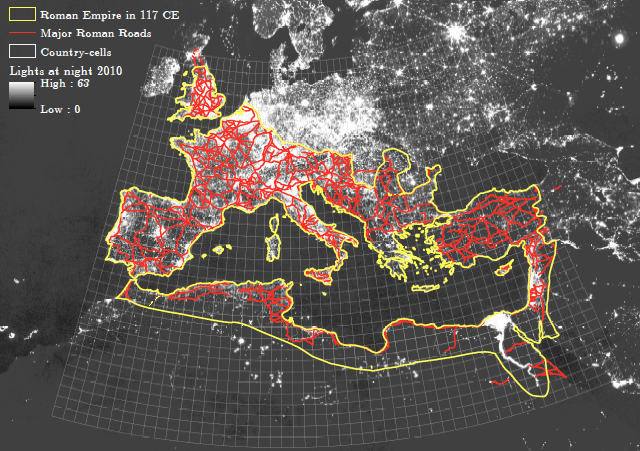 Researchers at the Centre for Economic Policy Research examined the amount of light emitted in territories adjacent to network of roads built millennia ago to service the Roman Empire, using light as a proxy for development and prosperity, comparing the light levels to light emitted by other parts of Europe, both those that were never part of the Roman Empire, and parts that the Empire conquered but did not extend their road network to. They found that the advantages of a public good -- as opposed to Roman rule or other factors -- persist for thousands of years, with benefits that are literally visible from space, with the naked eye. In some ways, the emergence of the Roman road network is almost a natural experiment – in light of the military purpose of the roads, the preferred straightness of their construction, and their construction in newly conquered and often undeveloped regions. This type of public good seems to have had a persistent influence on subsequent public good allocations and comparative development. At the same time, the abandonment of the wheel shock in MENA appears to have been powerful enough to cause that degree of persistence to break down. Overall, our analysis suggests that public good provision is a powerful channel through which persistence in comparative development comes about.